Ryobi combo kits were designed to help you get optimum performance out of your tools. This 18-Volt Rotary Hammer Kit Rotary Hammer, High Capacity Lithium+ Battery, and Charger. Never run out of power with the included Lithium-Ion Compact Batteries. All of these tools work with all Ryobi 18-Volt ONE+ batteries, the same platform that supports over 100 great Ryobi tools. The DeWalt DWD520 Hammer Drill features a patented motor design that generates 50% more power with increased overload protection for added durability. This dual mode hammer drill and drill is versatile enough for use in masonry, wood, or steel drilling applications. Includes 360 locking side handle, steel depth rod, and chuck key with holder. Powerful performance: Hilti's TE 7-C Rotary Hammer is the anchor hole expert with versatility. Perfect for drilling into concrete, stone and masonry using bits up to 1-inch in diameter, the Hilti TE 7-C can also do light chiselling on concrete and masonry. Built for long periods of demanding drilling and light chiselling, the ergonomic design and impact power of this rugged rotary hammer drill make it a professional tool - just what you would expect from Hilti. Upgrade your jobsite toolbox with the addition of a Hilti TE 7-C Rotary Hammer Drill today. 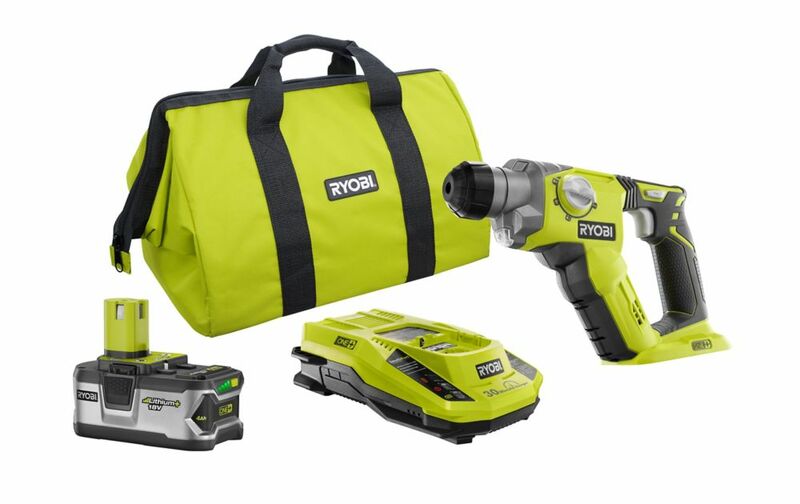 18V ONE+ Lithium-Ion 1/2 inch Rotary Hammer Drill Kit with 4.0Ah Battery, Charger and Bag Ryobi combo kits were designed to help you get optimum performance out of your tools. This 18-Volt Rotary Hammer Kit Rotary Hammer, High Capacity Lithium+ Battery, and Charger. Never run out of power with the included Lithium-Ion Compact Batteries. All of these tools work with all Ryobi 18-Volt ONE+ batteries, the same platform that supports over 100 great Ryobi tools. 18V ONE+ Lithium-Ion 1/2 inch Rotary Hammer Drill Kit with 4.0Ah Battery, Charger and Bag is rated 4.5 out of 5 by 35. Rated 5 out of 5 by RDB from I use it to drill holes in rock at the lake for my rod holders. Does it well. Fyi, lube the bit... I use it to drill holes in rock at the lake for my rod holders. Does it well. Fyi, lube the bit on the drill side with grease. Reduces friction on drill and bit. This is recommended on all SDS drills.